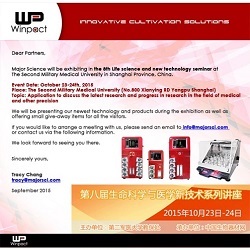 Major Science will be exhibiting in the 8th Life science and new technology seminar at The Second Military Medical University in Shanghai Province, China. 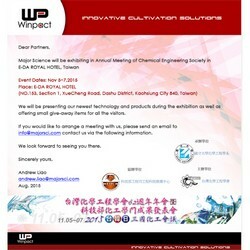 We will be presenting our newest technology and products during the exhibition as well as offering small give-away items for all the visitors. If you would like to arrange a meeting with us, please send an email or contact us via the following information. 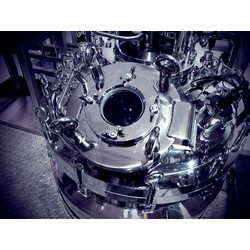 If you would like to arrange a meeting with us, please send an email to us. TV interview of Micro Innovation Co., Ltd vs Winpact Fermentor in all the TV channels in Thailand. 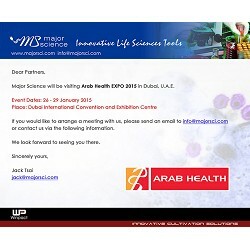 Major Science will be visiting Arab Health EXPO 2015 in Dubai, U.A.E. 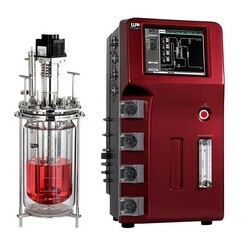 New product- Winpact SIP Fermentation System has been issued! 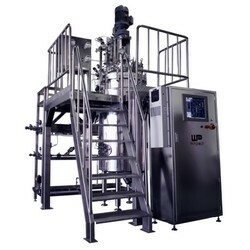 The Winpact Fermentation System is our top of the line, most innovative product in our product portfolio. We constructed the system with the top of the line and industrial standard materials to ensure the highest quality we provided to you.